George Frederick Keller, born in 1846 in Prussia, arrived in San Fransisco in the late 1860s. A talented cigar box lithographer and part-time cartoonist, Keller was plucked out of obscurity to draw for the new California publishing venture, The San Francisco Illustrated Wasp and commissioned to draw fear-mongering images of the Chinese for a gullible and nervous, Eurocentric-American public. Keller’s images have survived as some of the most vile distortions against the Chinese in California. When Keller began at The Wasp he was experienced with cigar art, but was a novice visual commentator on the body politic. He quickly learned on the job. Information available on the artist, business records and correspondence as well as extant archives of The Wasp are scant, likely lost in the 1906 San Francisco earthquake and resulting fire. “What I know about Keller is in my book,” wrote cartoon historian Richard Samuel West in an email. We have very little to go on regarding how the Wasp’s editorial offices ran. I suspect Keller drew what he was told. We can safely assume he didn’t have the relative editorial freedom that Nast enjoyed. There are too many cartoons in Keller’s opus that don’t make sense unless he was told what to draw; either that or he did not hold firm beliefs and those he did have (save anti-Chinese sentiment) evolved over time. There is little reason to believe that Keller had any feelings about the Chinese one way or another before arriving in California. Why would he since he may have never even seen a Chinese man before that, unless of course he was a full-blown racist, which was not a common characteristic of Prussians or Germans. We simply don’t know how he felt about anything. (West email). 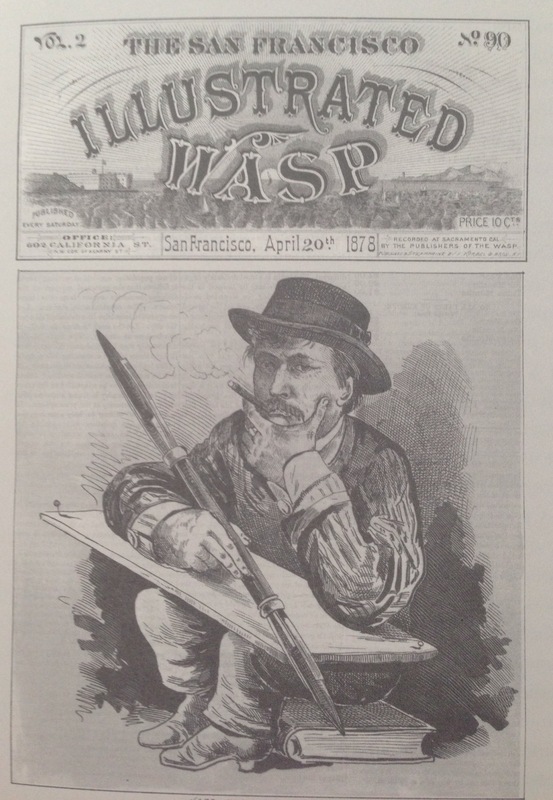 “In the midst of the explosive events of 1878, when hardly a day went without some extraordinary new political development, Keller drew himself on the cover of The Wasp, stumped for a cartoon idea” (West 41). Nevertheless, Keller continued on at the magazine for a solid six and a half years as The Wasp’s sole cartoonist, and rarely took vacations. Several art websites (with works for sale) erroneously list Keller as an American, born in 1850 and year of death as 1927, but all refer to work done while he worked for The Wasp.